There are several things that contribute to shoulder impingement and rotator cuff pain. Perhaps one of the biggest issues that impacts overhead athletes, Crossfit enthusiasts and the avid weight lifter is limited shoulder mobility. Poor flexibility in the pecs, lats, posterior shoulder as well as limited thoracic spine extension and rotation all contribute to suboptimal movement. Poor mobility can place the scapula in biomechanically flawed positions, increase glenohumeral internal rotation and restrict shoulder movement at end range creating compensatory movement and pain. The video below is a snippet from my upcoming webinar on rotator cuff dysfunction and nonoperative treatment. This webinar will be great for strength coaches, exercise enthusiasts, Crossfit athletes/coaches, athletic trainers and physical therapists. If you want to attend the webinar or catch the on-demand version, simply visit www.alliedhealthed.com. In addition, you may find my DVD on rotator cuff training very helpful in overcoming shoulder pain and staying pain free in the gym. Click here to see a brief video overview of the DVD or visit my site at www.BrianSchiff.com for more info. Use the code Holiday15 at checkout from today until December 25 to save $10 off the retail price. The shoulder mobility screen in the FMS often reveals side-to-side asymmetries. It is more common to see hypermobility in female clientele, while their male counterparts exhibit more hypomobility. Overhead athletes tend to demonstrate excessive horizontal external rotation and a relative loss of internal rotation on the dominant side. This hypomobility can be detrimental to overhead athletes and increase risk for overuse injuries if it becomes excessive. 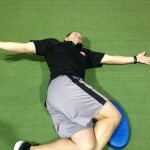 The following exercise is an effective way to improve shoulder mobility and optimize function. One important point is to focus on form and move very deliberately through the motion. Execution: Begin lying on the floor face up. Bend the left knee up to 90 degrees and cross the right leg over top of the left interlocking them. Roll to the left side and pin a folded towel or pad between the right knee and the floor. Place the arms in 90 degrees of shoulder flexion with the right on top of the left in an outstretched position. 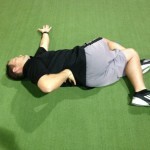 Next, slowly sweep the right arm up overhead and around the body as you attempt to place the torso/back on the floor. The finish position for the right arm will be reaching the right hand and arm up behind the back. Exhale as you perform the sweeping motion and hold the end position for 2 seconds. Reverse direction and return to the start position. Perform 5-10 repetitions on each side. Application: Limited shoulder mobility is a common finding, especially among male clientele with tightness in the pecs, lats and posterior shoulder. Asymmetry with respect to mobility is common with greater difficulty found trying to reach the dominant arm up behind the back on the FMS shoulder mobility screen. 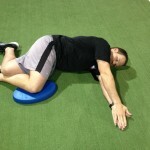 This exercise will help improve thoracic spine motion and shoulder mobility. The focus should be on strict form and proper stabilization to avoid unwanted motion. 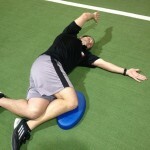 Pinning the pad (or towel roll) to the floor will help ensure better stabilization. If hypomibility is an issue and clients score a 1, foam rolling the pec minor/major, latissimus dorsi and the posterior rotator cuff musculature prior to performing the exercise will be helpful. 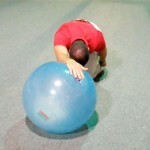 Stability training can be added in later once the soft tissue mobility restrictions and movement pattern is improving.